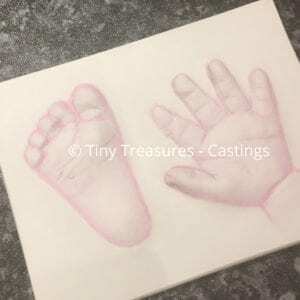 A hand and foot casting together with a photograph. The Mounted Memory Casting is made up of single hand and foot. We ask you to supply a photograph and your preferred wording for the plaque. You have a choice of frames, mounts and finishes to create your personalised display. This frame is available in landscape or portrait to match the orientation of your photograph.